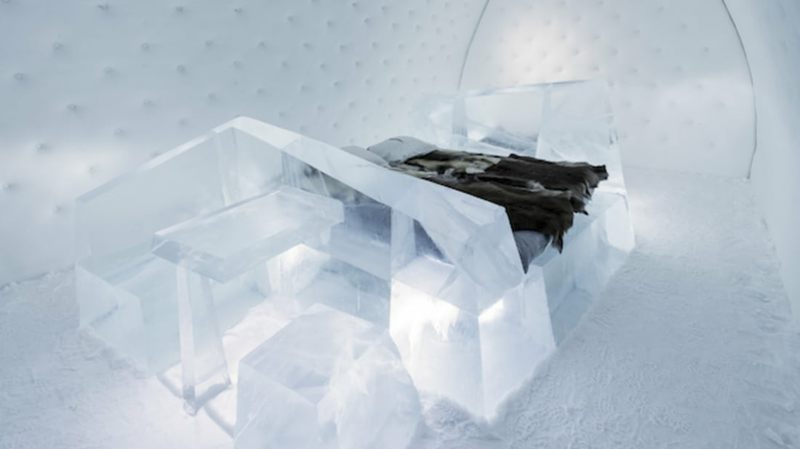 Last September, Sweden’s famed Icehotel revealed plans for the 26th edition of its fantastically frozen accommodations. Located 120 miles above the Arctic Circle, in a town called Jukkasjarvi, the Icehotel is constructed entirely out of ice and snow each year based on new designs supplied by artists from around the world. For the 2015/2016 season, the 19 suites will feature a life-sized African elephant carved from ice, a flock of sheep, flying buttresses, an ice cave decorated with Gothic pillars, and a 1970s-themed “love capsule.” Other offerings will include a room inspired by the 1920 silent horror classic The Cabinet of Dr. Caligari. Designs from previous years have been inspired by folk art, typography, 17th-century Europe, outer space, fairy tales, the nature of time, and unicorns. While the original Icehotel has spawned a number of similar structures around the world, as well as related ice bars and ice chapels, it’s far from the only striking hotel constructed out of natural materials. Here is a selection of six others from across the globe. Located in the world's largest salt flat, Bolivia’s Palacio de Sal is a hotel constructed entirely of salt—including the walls, floors, igloo-shaped roofs, and most of the furniture. The salt is compressed into tightly-packed, multihued bricks made by local artisans, who must continuously replace them throughout the hotel, especially during the rainy season. (The hotel’s electrical system also needs constant attention, since the salt tends to eat into the wires.) If a building made of salt sounds austere, note that the first-class hotel features well-appointed bedrooms with private bathrooms, a dining room, game room, and even a pool—saltwater, of course. Ever wished you could live in the sand castles you built as a kid? Well, now you can—at least for one night. And these aren’t the lumpy, bucket-shaped constructions of your childhood, but fully furnished suites with electricity, water, windows, and Wi-Fi. The two Zand Hotels were recently constructed as part of local sand sculpture festivals in a pair of Dutch towns with the delightful names of Oss and Sneek. Both are actually built inside sand castles: One features designs inspired by the Flintstones’ town of Bedrock, and the other has a Chinese theme complete with dragons and figures from the Terracotta Army. Sadly, the hotels are temporary and are already sold out, but similar structures will reopen at the festival next year, and there are plans for more permanent structures in Germany and the United Kingdom. No one has made an entire hotel out of chocolate—yet—but there have been at least two hotel rooms constructed primarily from the sweet stuff. In 2008 and 2009, Belgian chocolatier Godiva constructed an all-chocolate suite inside New York’s Bryant Park Hotel as part of a Valentine’s Day giveaway. Purchasers of a lucky box of chocolate received a stay in the suite, which featured chocolate walls, chocolate paintings, chandeliers dripping with chocolate, and a tempting-looking table filled with chocolate truffles. While nibbling was presumably allowed (we hope), guests were discouraged from lighting the chocolate fireplace logs or chocolate candles to avoid creating a sticky mess. That wasn’t the world’s only chocolate hotel suite: In 2011, designer Karl Lagerfeld created a chocolate suite at La Reserve Hotel in Paris as part of a collaboration with the Magnum ice cream bar brand. The room, meant to celebrate a new line of ice cream bars made with cocoa beans from Ecuador and Ghana, required 10.5 tonnes of chocolate to create. The centerpiece of the room was a chocolate sculpture of Lagerfield’s muse and the male face of Chanel, Baptise Giabiconi, clad in a pair of tighty-whities. It’s not just for horses: Straw is increasingly being used as a natural construction material for houses and other types of buildings, favored for its insulation and fire retardation abilities. The Maya Boutique Hotel in Val d'Hérens, Switzerland, is almost entirely constructed out of straw bales, with some reinforcement help from clay. The eco-hotel is self-sufficient in terms of energy, with much of the heat produced by solar panels. In keeping with the eco theme, all the furniture is made by hand by local artists using local wood, and each hotel room shows off a different species, such as pine, oak, pear, or ash. Built right into the sandstone cliffs overlooking New Mexico’s La Plata river valley, Kokopelli's Cave was originally intended to serve as an office for geologist Bruce Black. When that didn’t quite work out, he turned it into a bed and breakfast. The 1700-square-foot cave is located seven feet below the surface of the rock, and includes a master bedroom, living area, waterfall shower, and a replica Native American kiva (ritual area) with its own wood-burning fireplace. Kokopelli, by the way, is a deity often regarded in several Southwest Native American tribes as a fertility spirit, a trickster, and a hunter; you’ve probably seen him playing a flute. Located in a region known for its cork forests, the Ecorkhotel in Évora, Portugal, claims to be the world’s first cork-covered hotel. The main building is entirely covered in the material, which works as an acoustic and thermal insulator as well as making the 56 suites inside more energy-efficient. The hotel also boasts cork trees on its grounds, as well as an "eno-gastronomic" restaurant (focused, fittingly, on wine).